My sister and her three daughters arrive at the airport in two hours, 50 minutes. The house is cleaned. The beds are made. A few meals are planned and in the freezer. Even Dorothy the Dog is groomed and sporting pink bows around her ears. This week's My Town Monday post will be about whatever we end up doing on Monday. Maybe even just lolling around the pool! Here we are, the three sisters. 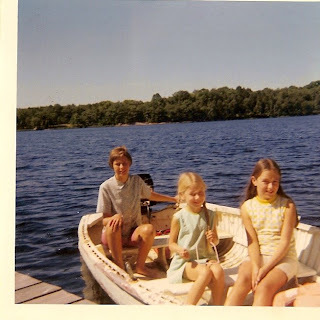 We're on a boat in Muskoka, Ontario. It's a summer many moons ago! EDITED TO ADD: It's 1:00 a.m., and my sister and I are finally going to bed. We've been talking for about 3 hours. We barely stopped to take a breath. Tomorrow? More of the same! I thought you guys might want to know what's happening in the world of our veiled chameleons. 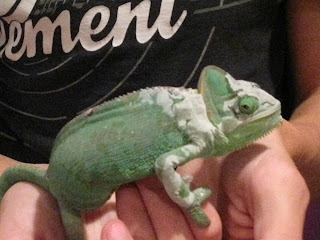 Here's the cutie patootie female veiled chameleon. She's the same busy mama who laid 23 eggs at the end of May. Now, she's busy growing and shedding her skin! 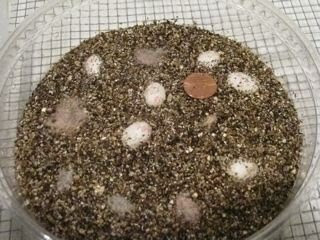 Here's one of the two deli dishes with veiled chameleon eggs. I pulled the dishes out of the incubator to take a couple of quick pictures for you guys. Even fewer healthy eggs in this deli dish. 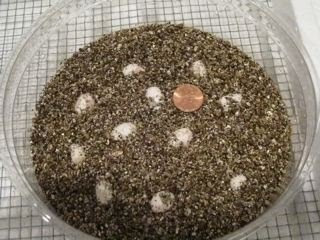 If you look at the egg in your upper left, you can see how it's being absorbed into the vermiculite (that soil stuff). There are several discolored eggs now. Eggs that aren't going to make it. So, out of 23 eggs, about 14 are still hanging in there. 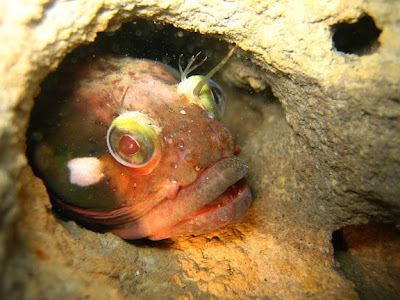 I guess the attrition rate explains why she laid so many eggs. Awwww....a little artsy shot of her taken just after I turned off the heating lamp. Well, actually I dropped my camera a couple of weeks ago, and if I don't squeeze it tightly when taking a shot, a little light sneaks in at the side. So, this is a light-sneaking-in shot. Veiled chameleons. They don't like to be held much. They don't make much noise. They're slow moving and pretty much just hang out in the upper 1/4 of the cage. Yet. I love having them as pets. Yup. 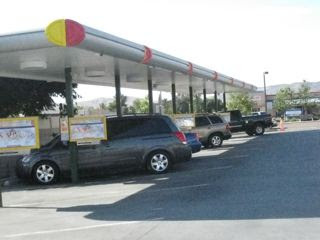 Yesterday, DH, Child #4 and I drove to the Oasis Camel Dairy in Ramona, CA. It was the one evening in July that the dairy farm was open to the public. Meet Sampson, a 3 year old, 700 pound male. He'll be mature at 6 years at which point he'll weigh about 1500 pounds. Sampson's one of 21 (hmmm...I think I got that number right!) camels on this 43-acre ranch. Sampson is short for his age. He was rejected by his mother at birth. He's been fixed. Male camels are snipped at about one year. Other trivia: Bull camels rut in the winter, beginning about November. Romeo, the bull at the dairy, likes to take care of business about 2 A.M. Camels are very noisy with lots of yelling and screaming. The Rieglers, the dairy owners, let their neighbors know that it's "that time of the year," so that there are no worries about what's going on down at the ranch. What else? Apparently, Romeo is very popular with the females. A little more trivia: Camel yarn sells for about $40 an ounce. 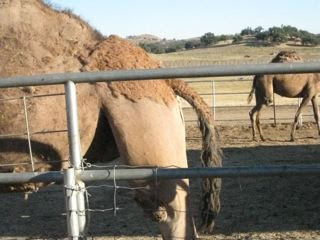 This is the back end of a pregnant camel. Camels gestate for 13 months! Yowzer! And they lactate for 18 months. And here's some camel speak for you: The pregnant female's raised tail says to the male: "Go away! I'm pregnant. And I am not the least bit interested in fun times with you." And from the back end of a nursing male, here's some more camel speak: In this case, the raised tail means, "Yay, the milk is here!" Admit it! 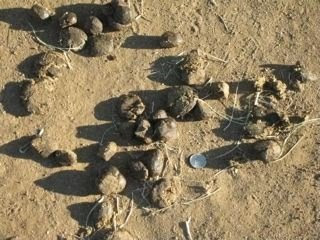 You were so hoping I'd snap a shot of CAMEL POOP. Next to a nickel (the only change I had) for perspective. Yes, I did it! 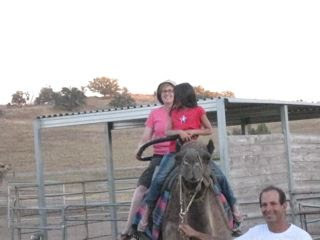 I rode a camel. Child #4 (at the front) talked me into it. It was VERY bumpy. I would never make it as a Bedouin. Thank you, Nancy and Gil Riegler, for a great and informative evening. 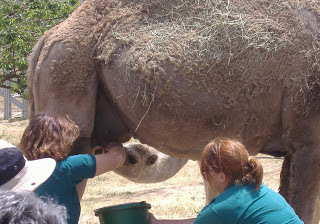 The second I hear, I will inform you guys of the date Dirty Jobs will air the Oasis Camel Dairy segment on TV. It was shot back in February. FINALLY....A GIVEAWAY!! I bought a bar of pomegranate-scented camel milk soap. Just for you guys. Well, for one of you guys! 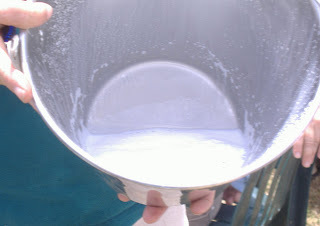 The soap was made at the dairy. Leave a comment by this Friday at midnight Pacific time. Child #4 will pick a name from a bowl. The soap's supposed to be great for your skin. It certainly smells good. Clair Dickson (Thanks, Clair!) set up a very adorable My Town Monday blog with links to all the participants. Please hop on over and check out everyone else's MTM posts. I did not bake this cake. Or any cake, for that matter. Child #4 wanted a "real" cake this year. By which she meant "bought"! We celebrated Child #4's 9th birthday with a makeover sleepover party! 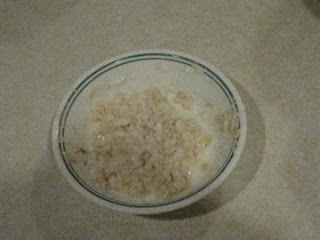 The girls patted an oatmeal + yogurt mask on their faces. 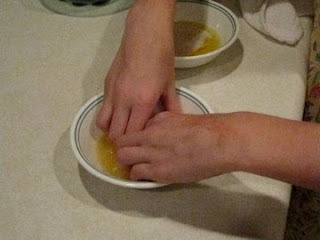 The girls soaked their tired nine-year-old feet in aluminum lasagna pans filled with warm water + foot salts. 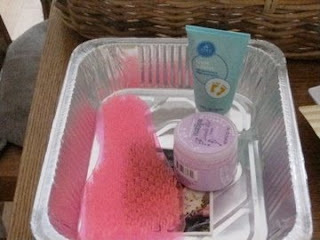 Then they massaged their feet with a rubber foot and used silky lavender lotion + oil. Of course, as the mother of the birthday girl and spa manager, I hung out a lot with the girls. And eavesdropped. Here are a few of the interesting things I overheard straight from the mouths . Spoken with much authority by one of the guests. She was explaining why Child #4's brothers were playing video games and not joining in on the spa fun. "Girls, girls! 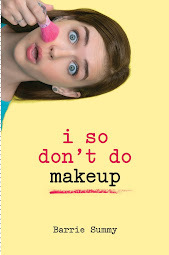 My makeup's falling off!" Shouted by one of the girls who had slapped on eye shadow and blush at 7 a.m., then promptly catapulted into the pool with the rest of the gang. "I don't know why she put eyeshadow right up to her eyebrows. Are we supposed to do that?" A question pondered by women around the world! "Mrs. Summy, you know what would make me really happy? If you gave us cake for breakfast and then let me go on your treadmill. It would be like I hadn't eaten at all." This last one actually bothered me. The girl who made the request is a cute, creative, chatty 9 year old girl of normal weight. Maybe I'm being overly sensitive about the eating thing because I'm reading Wintergirls by Laurie Halse Anderson, a YA dealing with anorexia. Or maybe 9 year olds should be thinking exercise=healthy not exercise=not gaining weight. There are A LOT of fun things to do in San Diego. A LOT. 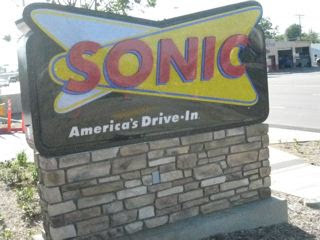 Some, like the San Diego Zoo and SeaWorld, everybody knows about. Some, though, are a little off the beaten path. Like the Oasis Camel Dairy in Ramona. You may have heard of Ramona on the news. It's where the Cedar Fire, one of our largest wildfires, began in October 2003. What else? 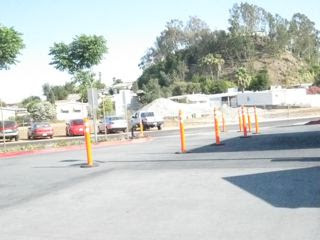 James Cagney owned a bunch of land in Ramona. As in 900+ acres. And the town got its name from the Indian maiden in Helen Hunt Jackson's 1884 novel Ramona. 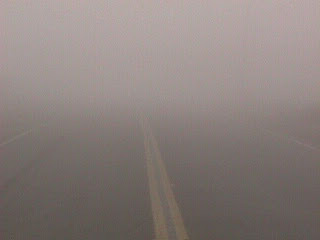 Ramona is about 37 miles northeast of downtown San Diego. Okay. Back to the Camel Farm. I've lived in San Diego for a little over, ahem, 20 years. And I've NEVER been to the camel dairy. BUT, the next monthly tour is July 11, and I'm so there along with at least a couple of my children. Gil Riegler and Nancy Kobert-Riegler run the 34-acre dairy, which, by the way, is the ONLY camel dairy in the entire USA. -Camels live to be about 50 years old. 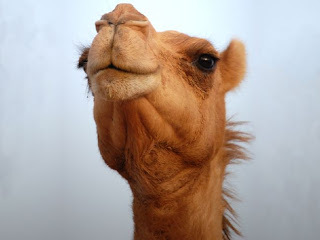 -Camels have THREE eyelids to help keep the dessert sand out of their eyes. -Gil was actually in the Israeli military and rode camels with the Bedouin. 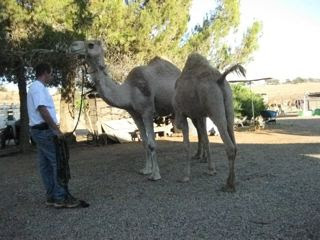 -There are about 18 camels at the dairy. 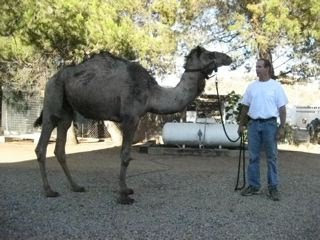 -You can rent a camel from the dairy for a party or Nativity scene. 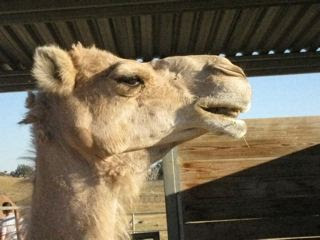 -Contrary to popular belief, camels really don't do a lot of spitting. Camels produce rich milk that can be fed to foals and crias (baby llama) who are sick or injured. Camel's milk soap is full of vitamin C and is great for sensitive skin. You can buy it at the dairy or order it online (website link below). 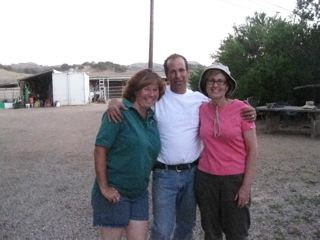 Mike Rowe of the Discovery Channel's DIRTY JOBS shot a show last Feb. at the Oasis Camel Dairy!! Here's a link to Nancy's blog post about that very cool event. 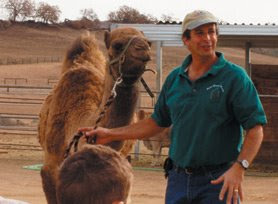 Here's the website for the Oasis Camel Dairy. Travis Erwin has stepped down as our My Town Monday leader. Although I'm sure he'll be back with future MTM posts because who can resist the allure of My Town Monday?! Holy Toledo! It's the SIXTH meeting of The Book Review Club! Without going all emo and touchy/feely, I'd like to say a million heartfelt thank yous to the reviewers. I've gotten to know most of you better through your reviews and emails and blog comments. Thank you so much for taking time from your busy schedules to blog about books. To give us your insights and opinions. To share a little of your reading life with us. I would like nothing better than if we could actually get together in real life. And a huge thank you, also, to all our visitors. We're getting a very nice turnout each month. It's wonderful to have this opportunity to write about what we're reading. And to know readers out there in the blogosphere are interested. There are some periods in history that just grab me. The Holocaust is one. The Salem witch trials is another. If a book, particularly a Young Adult, takes place during one of these time periods, I'm likely to read it. 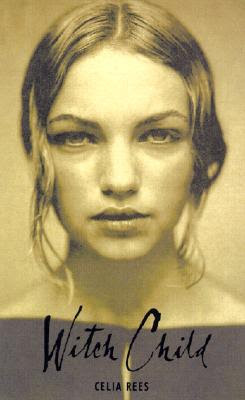 So, when Celia Rees' debut young adult novel, WITCH CHILD, was published in 2000 (it was re-released last month! ), I knew I'd pick it up. What I didn't know was how very much I'd enjoy it or how very often I'd end up recommending it. What a brilliant set-up. And from here we go on to learn the story of fourteen-year-old Mary Newman. In England, Mary witnessed the torture and hanging of her grandmother as witch. During the hanging, Mary is whisked away for safety reasons and finds herself bound for Salem in the New World. Now orphaned and forced to keep her past and her supernatural powers secret, Mary attempts to make her way in a Puritan society where even a whisper of the word witchcraft can prove deadly. 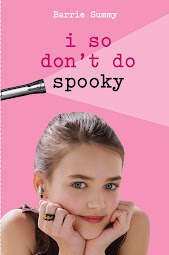 The first person point of view and the diary format made this an intimate read. 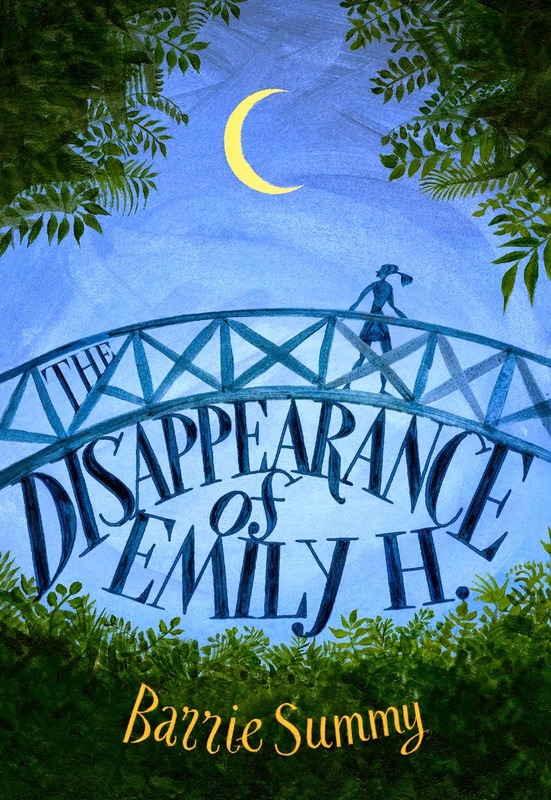 The suspicious society, fainting girls, and the minister who damned Mary's grandmother all work together to make this a tense read. The historical descriptions and careful language make this a rich read. There is a sequel--SORCERESS. It was enjoyable, as well. All in all, I'd recommend this book without hesitation. Please, please visit the reviewers below. You won't be disapopinted. You can see that there's quite a variety of books! Note to reviewers: If I missed linking to you, please leave a comment or email me. I keep pretty good tabs on the blog on review club days. Happy Canada Day to all our Canadian readers!